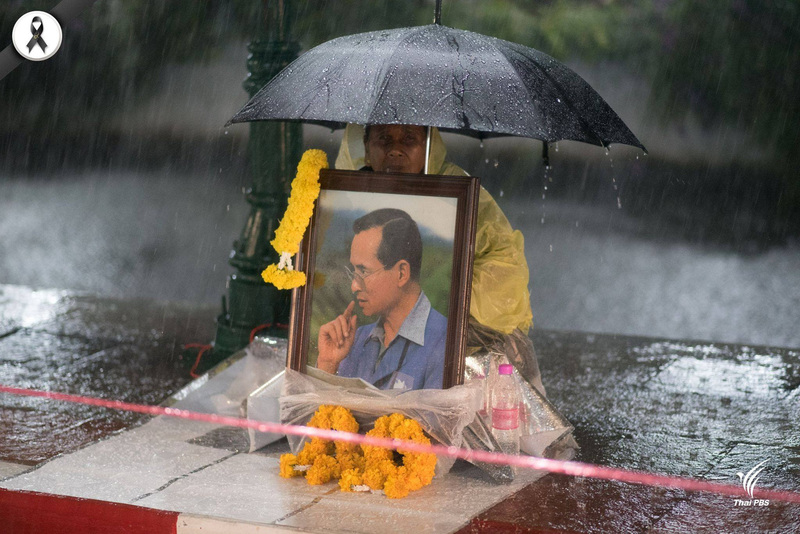 Our Season of Remembrance begins this Sunday at the end of the week of the funeral of his late Majesty, King Rama IX. We will pray for Thailand and give thanks for the life of the king, who guided Thailand with such wisdom for so many years. Our readings for this Sunday are Deuteronomy 34:1-12, 1 Corinthians 15:51-55, and Matthew 22:34-46, and we will be singing the hymns The Day Thou Gavest Lord is Ended, Be Still My Soul, Let us Break Bread Together, and Oh Thailand Fair! untouched by snow or ice! Oh Thailand, fair! Oh Thailand, fair! From Lanna to the sea! that Thailand may stay free. Sunday 29th October 11 a.m.
Sunday 5th November 11 a.m.
Saturday 11th November 10:30 a.m.
Sunday 12th November 10:30 a.m.
Sunday 19th November 11 a.m.
Next week we will celebrate All Saints’ Day. Our service remembering our loved ones, and the saints who have gone before, will be followed by a potluck lunch! Saturday November 11th is Remembrance Day. I, will be taking the ceremony at the Foreign Cemetery. This will begin at 10:30 a.m. Please attend if you can. The ceremony will be followed by lunch at the Gymkhana Club provided by the British Embassy. 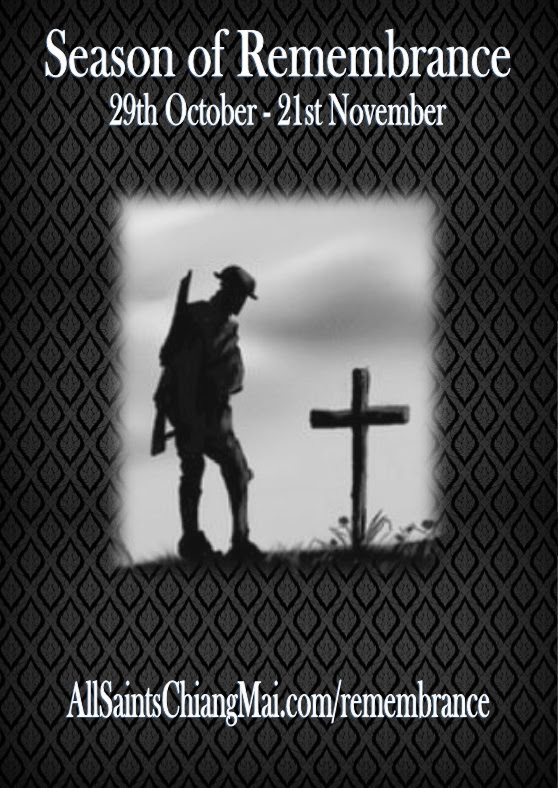 Our service on Sunday November 12th will begin at 10:30 a.m. to allow us to mark a two minutes silence at 11 a.m. Please note the earlier time and do not be late!!!! 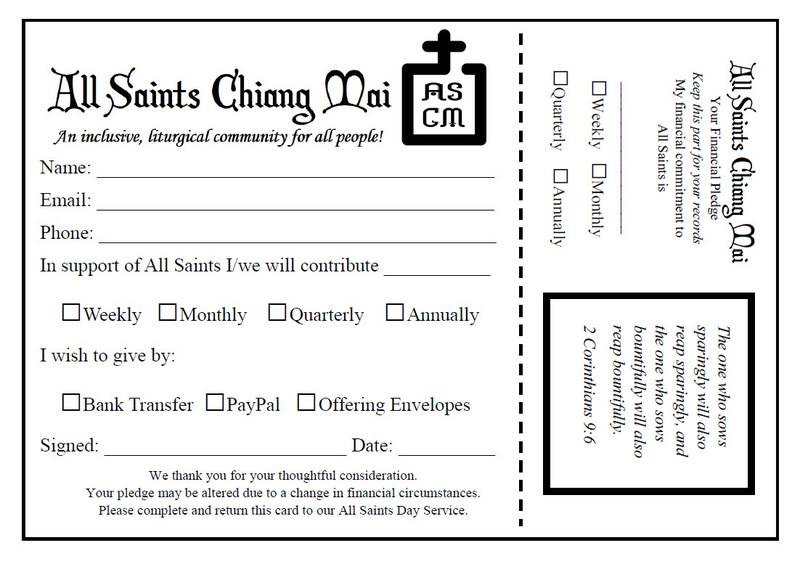 Three weeks ago our treasurer, Richard Murray, introduced the idea of pledge cards to All Saints. Those who wish to, can fill in a pledge card, pledging how much they wish to give each week or month. They can choose to give by bank transfer, PayPal via the church website, or through dated envelopes in the weekly offering. We hope this will help us all to prayerfully consider our giving, and will both increase and stabilise the weekly offering at All Saints, so we can do even more in service of God’s world!